Back when Ryan and I went to Arizona, I scored this awesome raw wool from Tempe Yarn & Fiber. It was a great shop, I highly recommend it if you live in the area and are into yarn and/or roving. What sold me was the cute picture of the lamb it came from! Look at that cute lamb face! I love it because it has some natural curl to it, which I think will make for some super cute tomte beards. They were a big seller at last year's Lucia fair, so I hope not to run out this year. I also am hoping to design a Lucia for this year's fair. Either needle felted or a combination of mediums - wish me luck! You guys, it's happening...we're going to the Motherland! Ryan and I will join his parents in celebrating 40 years of marriage (woo!) by taking a Scandinavian jaunt this Summer. I cannot wait!!! If you know me at all, you know that I'm already making my shopping lists and thinking about all the yummy fika treats to eat! I'm probably most excited for the vaniljhjärtar (vanilla hearts) because they are the one thing that I haven't had since I was last in Sweden. I make chokladbollar every now and then, and you can buy prinsesstårta from bakeries. You need specific pans to make the hearts, which I don't have, but very well may buy while in Sweden so I can make my own when we come home. So be prepared. I will come back from this trip with tons of pictures, goodies, and stories to share! As you probably already know, I have been wanting to get a big-girl camera for quite some time now. And now, it's finally happened! I've been saving up my profits from the craft fairs from last year, and when the camera I had my eye on went on sale at Best Buy last week, I decided to pull the trigger. I'm the proud new owner of the Canon Rebel T3i! And then there's always this guy to make a picture look good. That's all for now. Hope you have a great week! I am not a cake person [the horror!]. Sure, I'll eat it, but it's definitely not my go-to dessert. In fact, unless it's carrot cake, cake is probably near the very bottom of my dessert list. But this cake, on the other hand, I find absolutely scrumptious. I don't own a traditional Swedish almond cake pan, so I used a bundt pan instead. It seemed to work just fine. I baked it on the shorter side since it's not as thick as when it's baked in the traditional pan. This cake is dense and moist, and when sprinkled with powdered sugar it is sooo good. Next time, I'm going to drizzle some almond icing over the top. Yum. Mix first 4 ingredients. Stir in flour and baking powder, then add the melted margarine. Bake at 350 for 40-50 minutes (40 minutes was plenty of time when cooked in the bundt pan). Cool in pan before removing. Sprinkle with powdered sugar. EAT! If you haven't noticed, I've been a very into making my own drinks and syrups lately. Recently, I made yet another syrup - rhubarb. It was so simple and so delicious. I used Marissa's recipe from her blog, Food in Jars (I love her blog!). I had frozen bag of rhubarb pieces, already chopped and everything. I threw it in a pan with some water and sugar and let it simmer away until the rhubarb was broken down. After straining it all, I put it in a glass bottle and tucked it into the fridge. I'm planning on mixing with some club soda for a little rhubarb fizz. Add a splash of gin or rum and you have yourself a fancy cocktail! Update: I tried it mixed with some club soda (about a 1:3 ratio of rhubarb to soda) and a squeeze of lime and it was delicious! Be sure to stir it up - the syrup stays on the bottom if left not stirred. As I was sorting through my things, attempting to organize our kitchen, I came across a few leftover packs of glögg spice mixes from Christmas. I seriously considered making a batch of glögg right then and there. But after further thought, and realizing it was only 10:00 AM, I decided to make some glögg syrup instead. I took a bottle of wine, added a cup of sugar, and threw one of the packs in the kettle. I let it boil down and simmer away until it was a light syrupy consistency [not as thick as pancake syrup...more along the lines of those syrups they use to flavor coffee]. After straining out the solids, I was left with these two lovely jars of glögg syrup. I may or may not drizzle it over some vanilla ice cream when I start missing Christmas. The rest will be kept in my fridge until this fall when I decide to whip up a mug or two of glögg. I've been doing quite of bit of tinkering in the ol' craft room lately. And I decided to see what the Dala chalkboard would look like with ribbon to hang instead of just the back hooks. I really like the ribbon because now it is reversible! Plus, ribbon is just cute. I hung this up in the craft room/office and I've been leaving Ryan little notes. I'm thinking about hanging it on our front door, in fact, I just might. It was wonderful. I got to sip coffee all morning long while having a ball browsing my cookbook stash. I decided to try these toffee cookies from IKEA's Fika cookbook (which is awesome, for the record). I've only made a few recipes from it so far, but each one has been a winner. They turned out wonderfully! My favorite kind of cookies - chewy, not overly sweet, and perfect dunked in a cup of coffee. We brought them to a party and Ryan has already asked me to make some more for just us...and I think I just might. Here is the book itself - really fun pictures for each recipe. I really like how they have most of the classic Swedish fika treats in it - reminds me of the motherland. I really want to try the vanilla hearts, they were one of my absolute favorite treats when I studied there. They will definitely be one of my next baking projects! I'm kicking off this weekend by clipping off some fresh mint and making some infused vinegar. I'm really living on the edge. I got the idea from the book I've been using a lot lately, Can it, Bottle It, Smoke It. I was going to make some ginger-infused vinegar with the leftover ginger I had from the ginger beer, but alas, it went bad. So I ended up with just using mint from the garden. I've been really into mint tea these days, so mint vinegar sounded like it would be a good addition to our pantry. If you want to make your own - simply add some fresh herbs to about 2 cups of vinegar (I used apple cider vinegar). Let sit out for about two weeks and then strain out the herbs. Voila, done! Yay for weekends and for cheap thrills like infused vinegars. May your weekend be full of the wonderful little things that make life amusing! Caryn and I had our first official 2014 Sister Crafting Day meeting back in February (it's already March?!) 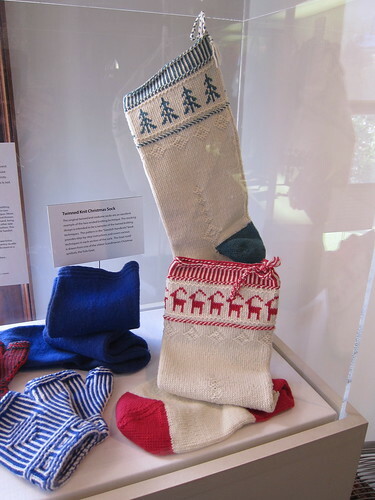 and we've decided on our project for the year - Christmas stockings! I really like the heart one with the tulip border on top. Plus the snowflake one is cute too, all very Scandinavian looking, which was obviously top priority. :) I was even thinking of making the reindeer one into a Julbock instead for Ryan's stocking. We haven't actually started making them yet, but picking out a pattern and drinking coffee counts as a craft day in my book. In other news, our apartment is almost completely unpacked! It's a March miracle! We still need to put up some artwork to brighten it up, but it feels good to have things out of boxes and where they belong.